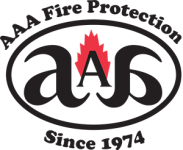 AAA Fire Protection Services offers 24-hour service in addition to comprehensive design and installation of fire sprinkler systems. For over four decades, we have provided Pleasanton businesses and businesses throughout the East Bay Area including the Tri-Valley area with comprehensive fire protection services. As experts in the fire protection industry, we understand the consequence that fire has on businesses. That is why our team of experts is willing to work with architects and design companies for new building projects or projects that involve renovations. We work with your team to design quality and affordable fire sprinkler systems. Our fire sprinkler services begin with quality fire sprinkler installation. In addition, we maintain your fire sprinklers with fire sprinklers inspections that help us identify fire sprinkler deficiencies. When a deficiency is found, we offer fire sprinkler repairs which help to keep your business fully protected from the effects of fire. After four decades of helping businesses just like yours, we have learned a thing or two. We understand how to help you easily comply with governmental regulations for fire suppression. For more information about our comprehensive services, just give us a call at (800) 543-5556. Any one of our highly trained professionals will be happy to answer your questions or to provide a detailed quote for your building project.